Non Flexible product. Bookings at this special price cannot be cancelled or have the dates amended. Only personal details can be amended. 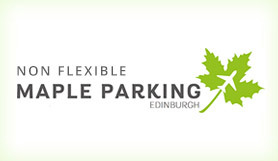 Book Edinburgh Maple Parking Meet and Greet service, the only offsite Meet and Greet service at Edinburgh airport (Previously known as ACE Parking). This product allows you drop your car off with a uniformed chauffeur outside the terminal, leaving you just a short walk inside. You can then board your flight knowing your car is parked in a secured car park away from the terminal. When you arrive back to Edinburgh airport, your car will be waiting where you left it with your chauffeur ready to hand back your keys. This is a great way to park at Edinburgh airport. This service was previously known as ACE Parking. Vehicle Restrictions: Parking is for cars only and cars must fit in to a standard sized parking space (2.4m wide x 4.8m long). Extra charges will apply for cars that do not fit in to a standard parking space and must be arranged with Maple Manor prior to the drop off date. Very large vehicles and minibuses may be refused if prior arrangements are not made. Minibuses / vehicles with more than 8 passenger seats cannot be accepted for Meet & Greet services.